We have to be honest and say that if we’d been on a hire boat instead of Waiouru we’d probably have been less stressed by the passage! This is the same side that previously had the zip damaged. The material is now held in place with Duct Tape and we’ll have to get it repaired when the weather is better. There’s no point in leaving the cratch open to the rain! We also lost a fender which was snapped off on leaving the lock. A decision has now been made to cruise with the fenders up. 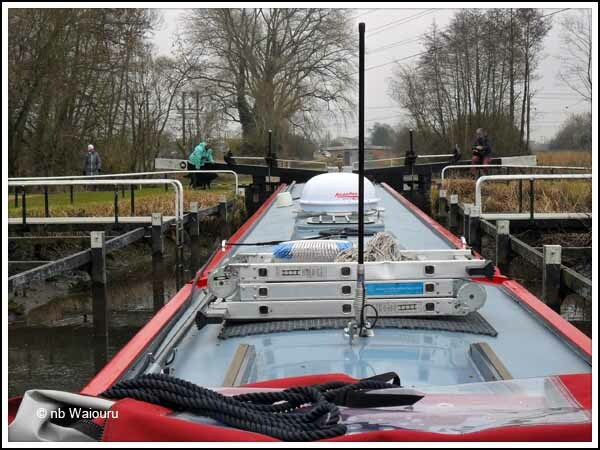 There was another discussion whether to open both gates in the wide locks. We’ve decided to stay with opening only one gate and see what happens! We’ve always known that the area below the gunwale and the rubbing strakes will have to be repainted annually. At Monkey Marsh Lock (one of two turf sided locks) there was a ‘towpath helper’ who happily assisted Jan with the lock gates. Jan was both horrified and amused to see the way this hirer had moored their boat and went back to take a photo. 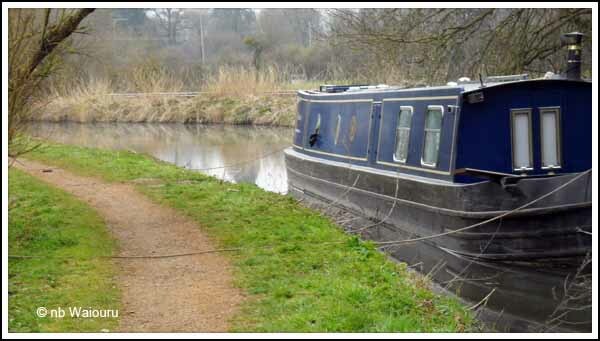 Yes….. mooring ropes across the towpath and tied to trees. Fortunately they were only moored briefly whilst they had lunch. 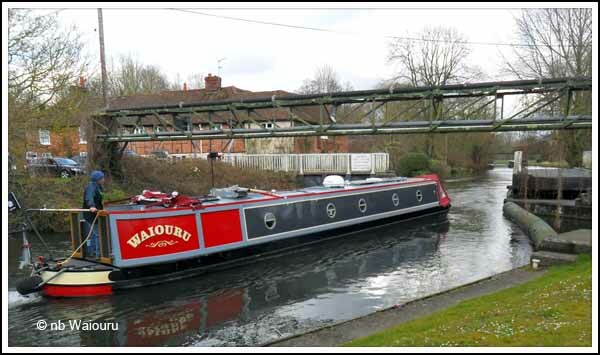 We had a late lunch on the 48 hour moorings above Woolhampton Lock and made the decision to go down the lock and through the swing-bridge instead of staying on the moorings for the night. Rain was forecast and the river had already risen. The plan was to empty the lock and I would ‘hover’ in it whilst Jan went forward and opened the bridge. She would then call me forward using our two-way radios. After I passed through the lock I would swing the tiller over and attempt to lasso a mooring bollard so she could re-board. If that didn’t work Jan would have to walk all the way to Aldermaston. Waiouru was travelling quite sedately until she it the current and then we went on an exciting ride. Using just enough rev’s to maintain steerage worked until I needed to get the stern to starboard on the approach to the bridge. Into the bridge hole and I frantically had to get the tiller arm to port. Once clear of the bridge Waiouru had to be thrown hard into reverse whilst simultaneous attempting to throw a lasso over a bollard. It actually worked and Jan managed to re-board. It’s so nice when a plan works! Dinner is on the stove and I’m about to have a cold lager. A satisfying day! We also learned that the best and only job for fenders is when the boat is at rest. We lost countless fenders in locks in the vain hope that we could protect the paintwork. We now just re-paint her as we go along. 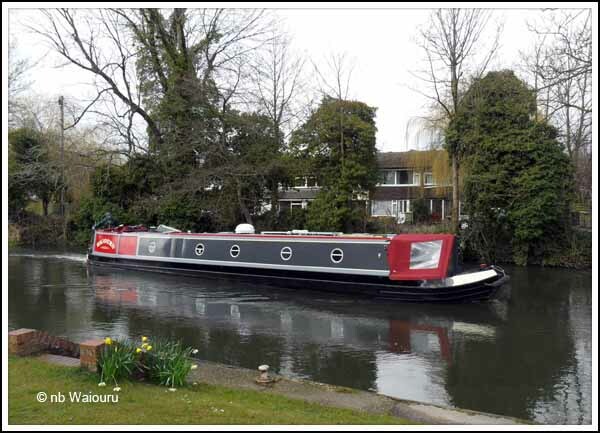 Hi Tom, I caught and tore our cratch cover a couple of times going in and out of locks, so I had these longitudinal fenders made up, I fitted them to the boat with ss shackles and saddles. That was quite a few months ago, no more problems. Nice fenders but I assume they only fit in single locks? Our damage occurred when attempting to squeeze out one gate of a double lock that wasn't quite as wide as others we had fitted through during the day. If your fenders make the width of the boat even wider then it wouldn't fit through any of the gates and we'd be forced to open both gates. However your fenders seem like a good idea for single locks. An eventful day you two. Just touch up as you go along, that's what most do.. Heh, I am too lazy to do that and do it once a year or so! Trouble is I take NP into very odd places and it is a daily paint removing jobbie.. I think I would spend more time with a paint brush than I would cruising! 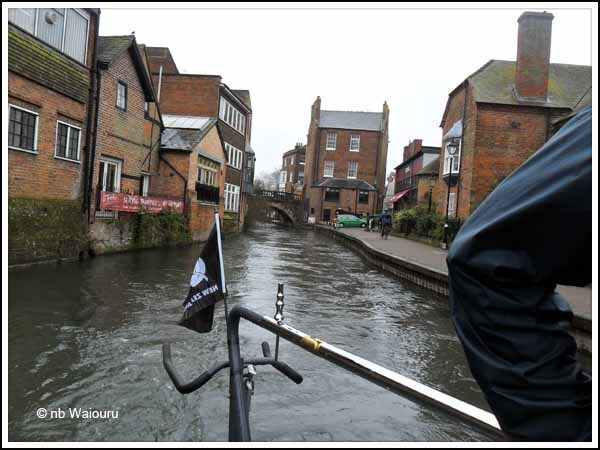 Get knotted in Warwick made them, they make the boat very slightly wider, we still go through double locks on 1 gate no probs. I think they were 50 quid for the pair. Thanks for the additional information Paul. I'll remember Get Knotted when we reach Warwick. I have wondered why use is not made of nylon sheet (http://www.directplasticsonline.co.uk/UHMWPE_Sheet.html) fixed along the rubbing strakes to protect against damage. One problem is that the beam of the boat would be permanently increased resulting in reduced clearance in narrow locks so I suppose to use this would require allowance made during hull construction . On another note the opening of only one gate at broad locks has been commented as undesirable with the increased risk of damaging the sealing edge of the unopened gate (although I admit that I have been guilty of this practice). I suspect it's not used because builders tend to be very traditional and only very slowly incorporate new products. The shell builder might also have to modify their jigs to make the bow narrower. However I understand the Sea Otters have a rubber rubbing strake which I'm told (by an owner)is very effective. Sometimes we can't open both gates. Jan can't walk across the top beam of the lock gate and (on the K&A) often only one set of gates has a walkway. If she opened both gates she would be trapped on the far side. However my preference would be to open both gates rather than squeezing through a narrow opening. 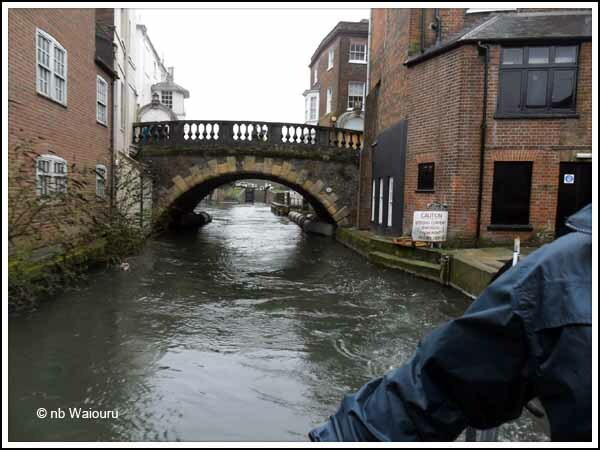 Tom - single gating can (and does) damage the gates if they are wooden - more so when going down as the gate has nowhere to go if you hit it but in my view it is not good boating practice and, if you single gate on the Wey you will be politely, but very firmly, requested not to. 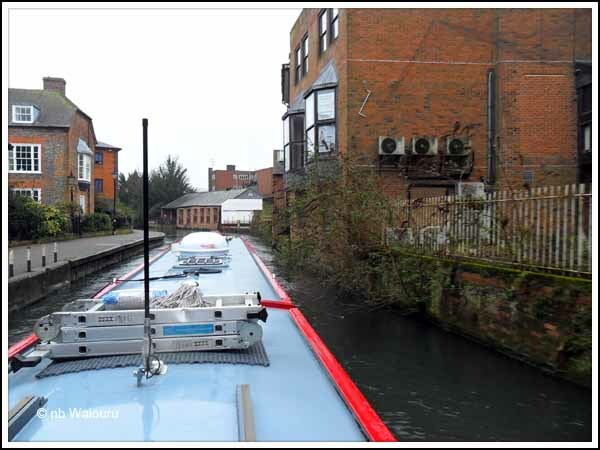 What happens is the mitre joint gets damaged at the level of the gunwale over time and the gates start to leak and eventually an expensive repair or gate replacement has to be undertaken. Oh boy, steep learning curve, eh? 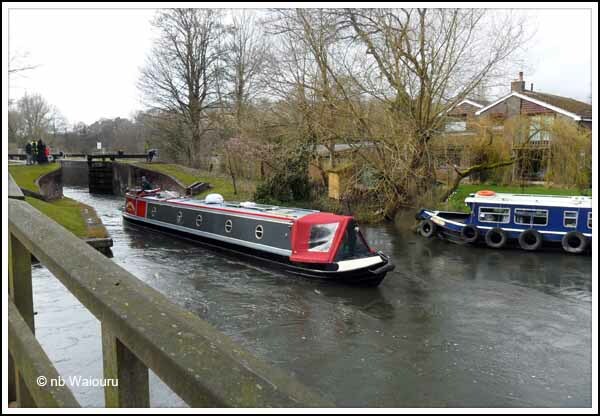 If you do anything to make your boat wider, you won't be able to get up Hurleston Bottom Lock, and the Llangollen will be closed to you. Sea Otters have to lean over sideways in that lock. 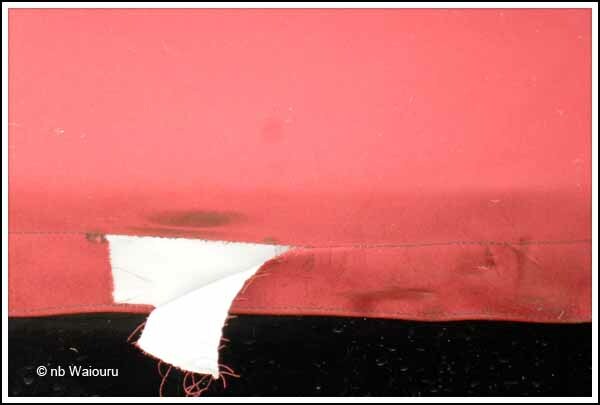 If you must boat with your cratch cover down, at least tuck the bottom edge behind the gunwale to protect it. Boat builders are slow to modify the basic shape of a boat for very good reasons – that shape has evolved to fit the narrow canals and anything else usually causes more trouble than it solves. What a very sensible suggestion. We'll tuck the flaps back inside the profile of the boat when moving and accept a small amount of rain water may enter the cratch whilst cruising. I can appreciate how the lock gates can get worn at gunwale level if only one is opened. However I haven't been able to work out a method of opening and closing both gates on some of the locks we've found on the K&A. These locks only have a walkway on the lower gates. The upper gates require you to climb up onto the gate beam and walk across it. This is something Jan is unable to do. The only solution I can see is for Jan and I to exchange roles and for her to steer. It's something I would like her to learn but she is currently most reluctant. Perhaps this will change as her confidence grows over time!